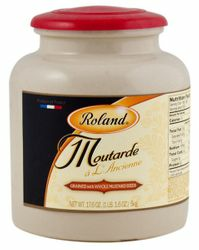 Roland Grained Dijon Mustard with White Wine and whole mustard is a blend of powdered mustard combined with whole mustard seeds, seasonings and wine for flavor. It is milder in taste than our smooth mustard but has more bouquet. Packaged in a reusable crock, Roland Grained Dijon mustard can be used in all dishes calling for Dijon mustard, especially if you are looking to add a different twist to salad dressings or sauces. Mostaza Dijon con Vino Blanco de Roland. Outstanding mustard. Got my first taste at a friend's house and she gave me the crock, and then another was my Christmas present. I am so glad to have found it online. Worth every penny. Outstanding mustard! Worth every penny.